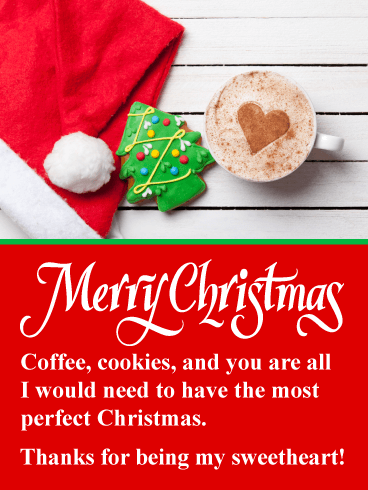 If you and your special someone really loves cookies and coffee, then they will really appreciate this cute romantic Christmas card. It displays a fantastic frosted Christmas tree cookie, a Santa hat, and the best cup of coffee ever, complete with a special heart made of cinnamon. The fancy Merry Christmas lettering adds to the festive look of this holiday card! Get these Christmas goodies over to your sweetheart today so they can enjoy them on Christmas day! 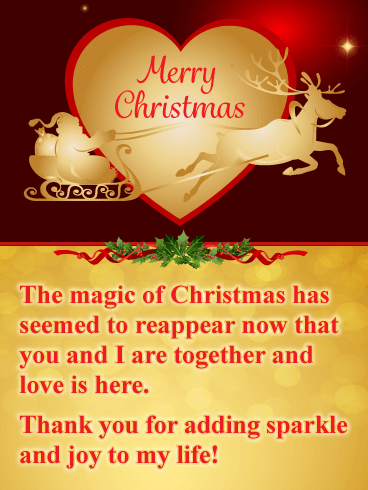 This fabulous Merry Christmas card showcases glittery gold and red Christmas ornaments and a sparkling background. It's the perfect setting for a romantic Christmas card! 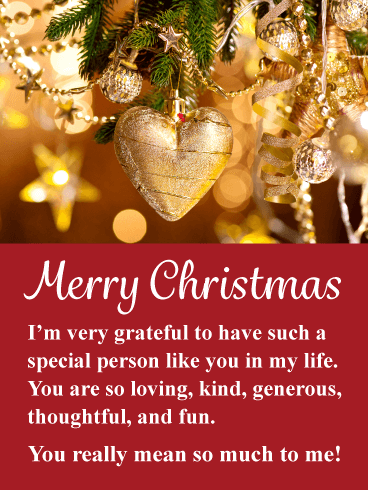 The message would be great to send to the person who is so very special to you. It tells them that from the day you met, you knew they were the one. Those words would mean so much to them on Christmas day. Send some romantic holiday cheer to the one you care about today! If you are looking for a truly romantic Christmas card, you have just found it! This beautiful greeting card showcases red ornaments that are in the shape of a heart resting on Santa's hat. It has an exceptional look and will capture the heart of the one you care for. 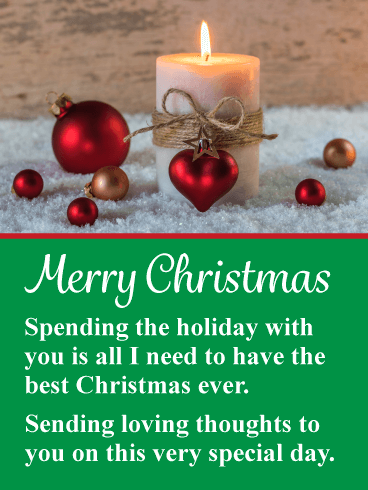 This fabulous Christmas card will allow you to send loving thoughts and add joy to someone's day. It also features a snowy background that adds a romantic touch. Send this special Christmas card out to the one you love soon. We all experienced the magic of Christmas when we were kids but forget so easily as we grow older. If you have met someone that has made you experience the magical moments of Christmas again, let them know! They will certainly feel special knowing they have this effect on you, and that they add sparkle and joy to your life. This exceptional Christmas card features Santa and his reindeer soaring through the sky. They pass by a moon in the shape of a heart. So romantic! This fun and romantic Christmas card will bring a smile to the face of the one you are thinking of. It showcases a loving couple sitting in front of a Christmas tree while wearing Santa hats. So cute! 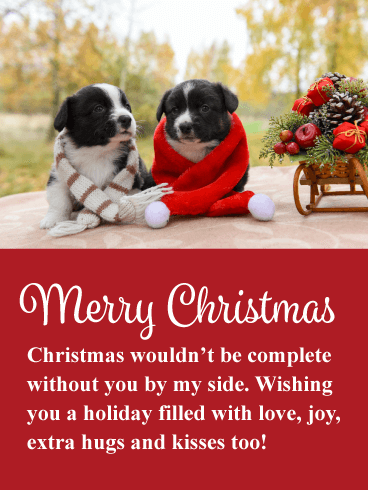 This festive Christmas card's message lets them know how special they are to you and that you are thankful to spend this holiday season with them. Make sure to let the person you care about know how you feel in time for Christmas! You can never go wrong when sending red roses to the one you love. 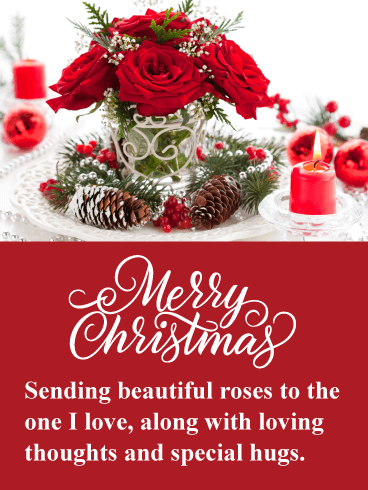 This exquisite Christmas card pictures beautiful red roses in a lovely vase. They are surrounded by charming Christmas items such as red ornaments, a burning Christmas candle, and snow-frosted pine cones! It's a special scene that will warm the heart of the person you care for. Deliver these roses in bloom without delay so they can enjoy them on Christmas day! Christmas is worth celebrating and so is love! This Christmas card celebrates both with its caring words and impressive design. It displays a couple toasting with fabulous champagne classes! A Christmas tree with sparkling lights is seen in the background and it adds a romantic feel to this Christmas card. Let them know this day will be one to remember by sending this terrific card to them for Christmas! Cozy Christmas socks are the best, and are what make this Christmas card so great. They set the scene for a couple spending a romantic evening together in front of the fireplace. A Christmas ornament and a present also fill the image and give it a nice holiday feel. 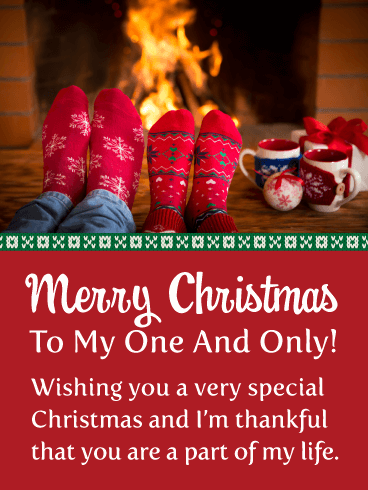 So let your "one and only" know that you are thankful that they are part of your life by sending this cheerful Christmas card out right away! This sparkling Christmas card has romance written all over it! It features a lovely red candle against a glimmering background. It looks gorgeous and they will certainly appreciate that you are sending them such a special Christmas card. What will mean even more to them is the loving message that explains that they light up your life. Send this dazzling Christmas card out today while this romantic candle is still lit! If you are looking for a fun romantic Christmas card, then you are in luck! This Merry Christmas card features two snowmen, side by side, wearing red Santa hats. There're so adorable! Next to them stands a couple in love holding a Christmas gift. The snow falling gives this Christmas card a romantic or dreamy look. It's perfect! The sweet message says that you love spending time with them, and this will make their Christmas extra special! 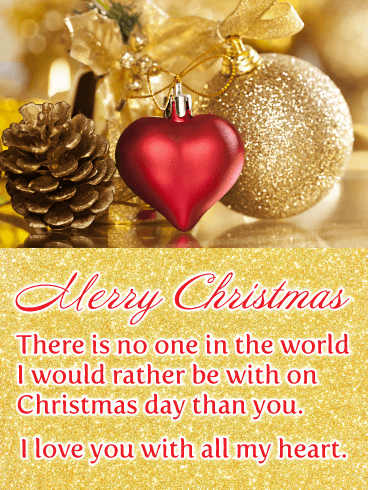 This romantic Merry Christmas card was designed to be sent to the one you love with all your heart! It displays a beautiful heart ornament surrounded by gold glitter and has a very elegant look to it. This Christmas card will tell someone that there isn't anyone you would rather be with on Christmas day. This will make them feel very special. So be sure to send a little romantic sparkle their way to wish them a Merry Christmas and brighten their day. This adorable romantic Christmas card will be sure to capture the heart of someone special! The two puppies are wearing scarfs and one of them resembles Santa's hat. It's so cute you can't help but smile! 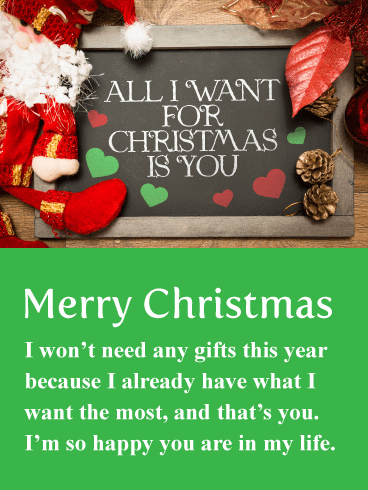 The romantic message states that Christmas would not be complete without them by your side. So very sweet. Get these Christmas puppies over to the one you care about so they can have a Christmas filled with hugs and kisses! Christmas is a very special day of the year, and that's why it's so important to send the very best. This romantic Christmas card showcases outstanding ornaments of red and gold, and feature beautiful white bows. 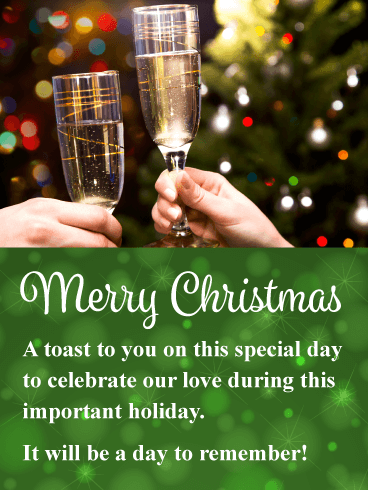 The Christmas message is caring and thoughtful, perfect for the one you love! It expresses that the person you care about brightens your days and adds joy to your life. It will certainly make this Christmas a memorable one! A beautifully decorated Christmas tree and two glasses of Champagne are all that's needed to let someone special know you are thinking of them! This Christmas card was designed for a couple that wants to make the most of this wonderful holiday. It has a magical shimmery look that gives it a romantic feel. 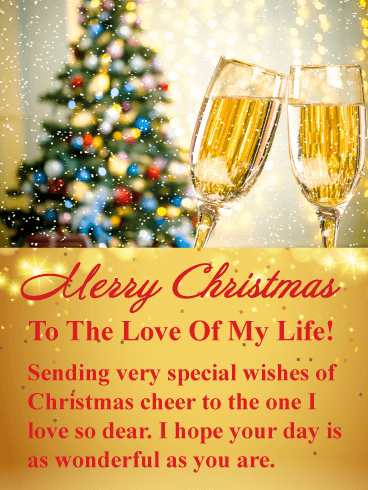 This Christmas card will tell someone that they are the love of your life! It's a very nice holiday card that will touch the heart of the one that means so much to you. Send a romantic Christmas card to the one you care about that will show them exactly how you feel! There will be no confusion when they see this Christmas card that features a couple in love holding a heart. 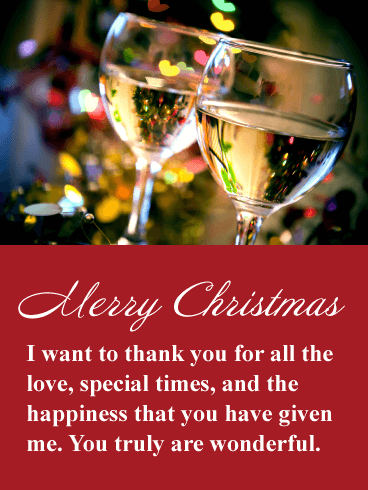 The special message expresses that Christmas is more special now that they are in your life. This wonderful Christmas card will warm the heart of the one you love. 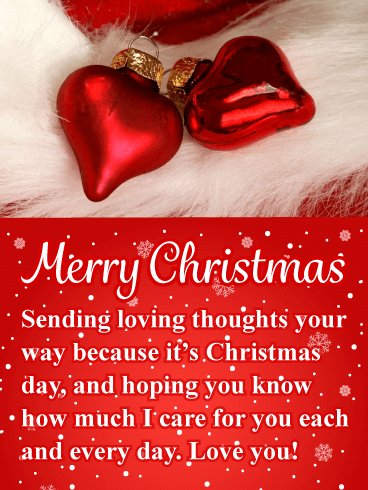 Send it out today to wish them a Merry Christmas in a loving way! This lighthearted romantic Christmas card is a fun way to let someone know how you feel about them this holiday season. It features a creative sign that states "All I Want For Christmas Is You". It will surely put a smile on their face! It's surrounded by hearts, pine cones, and a cute Santa. The message expresses that you are so happy they are in your life. This fun Christmas card is going to make their day! 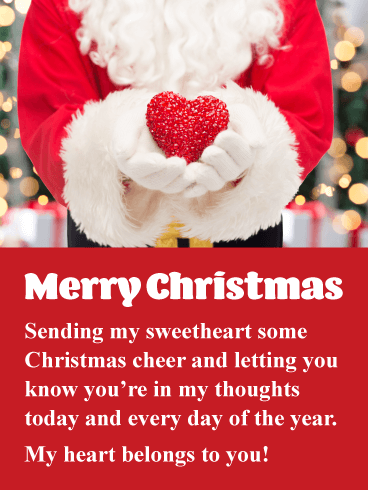 What better way to let your sweetheart know you are thinking of them than to send a Christmas card that features Santa holding a sparkling heart! You can even see glittering Christmas tree lights in the background! This fun romantic Christmas card will make their holiday extra special. The best part is that it will tell them that they are in your thoughts every day. So special! So send Santa on his way to deliver some Christmas cheer to the one you hold so dear. This sensational Christmas card will brighten the day of the person in your life that you care so much about. It showcases a fantastic red heart ornament and an impressive candle that is burning bright for the holiday season. It certainly represents romance and love! This greeting card expresses that you just need to spend the holiday with them to have the best Christmas ever! They will be touched when they read this. 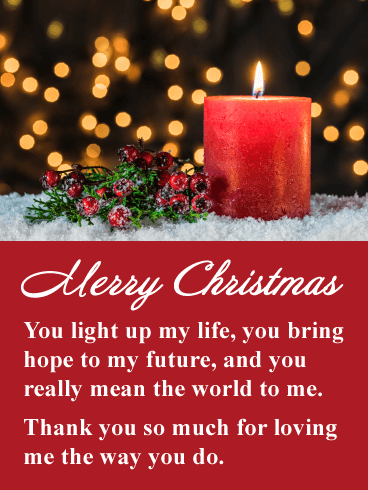 Send this candle out today to touch their heart on this Christmas day. Send this very romantic Christmas card to the one you love! It showcases two wine glasses with Christmas tree light reflections in them. It looks beautiful! The red background features special gold stars that add to the fantastic holiday design of this Christmas card. The message expresses that you appreciate all the love and special times they have given you. This Christmas card will light up their day with happiness! This romantic Christmas card displays a gorgeous golden heart surrounded by other exquisite tree ornaments. It has an exceptional look to it and will certainly impress the one you love. This shimmering Christmas card will let them know that you are very grateful to have them in your life, and that they mean so much to you. This alone will be a wonderful Christmas gift to them. Send this lovely romantic Christmas card out today to warm someone's heart on this special day.